WASHINGTON, DC, March 28, 2014 (ENS) – The Obama Administration today issued a strategy to reduce methane emissions from landfills, coal mining, and agriculture, and oil and gas systems as part of the President’s Climate Action Plan, announced last June. 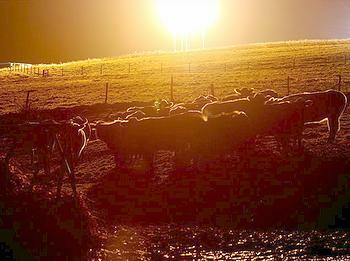 The main component of natural gas, methane is a greenhouse gas that is 21 times more potent than carbon dioxide. The strategy commits to new steps to cut methane emissions and outlines the administration’s efforts to improve the measurement of these emissions. In the summer of 2014, the U.S. EPA will propose updated standards to reduce methane from new landfills and take public comment on whether to update standards for existing landfills. In April 2014, the Bureau of Land Management will begin the rulemaking process to implement a program for the capture and sale, or disposal of waste mine methane on lands leased by the federal government. In June, in partnership with the dairy industry, three federal agencies will jointly release a “Biogas Roadmap” outlining voluntary strategies to accelerate adoption of methane digesters and other cost-effective technologies to reduce U.S. dairy sector greenhouse gas emissions by 25 percent by 2020. The U.S. Department of Agriculture, the Department of Energy and the EPA are collaborating on this effort. Three actions will affect the oil and gas industry. This year, the BLM will propose updated standards to reduce venting and flaring from oil and gas production on public lands. This spring, EPA will assess sources of methane and other emissions from the oil and gas sector. EPA will solicit input from independent experts through a series of technical white papers, and in the fall of 2014, the agency will determine how best to pursue methane reductions from these sources. If EPA decides to develop additional regulations, it will complete those regulations by the end of 2016. Taking action to curb methane waste and pollution is important because emissions of methane make up nearly nine percent of all the greenhouse gases emitted as a result of human activity in the United States. WHITING, Indiana, March 28, 2014 (ENS) – The U.S. Coast Guard and the Environmental Protection Agency are still managing cleanup operations following a crude oil discharge Monday night from the BP Whiting Refinery, located on the southwestern shore of Lake Michigan and the Indiana Harbor Ship Canal. Personnel from Coast Guard Marine Safety Unit Chicago and the EPA responded Monday night and found an area of about 5,000 square feet covered in crude oil. BP established an incident command post and deployed about 1,000 feet of boom, along with six vacuum trucks for containment and recovery operations in a cove adjacent to the refinery, the sixth largest in the United States. Tuesday morning, Coast Guard pollution responders found some of the oil had made landfall along the shoreline of the cove. They found tarballs less than one centimeter in diameter, averaging 20 tarballs every 10 feet of shoreline. During the past two days, response and cleanup crews contracted by BP worked to clean up and remove oil in the water and along the shoreline. Cleanup crews placed more than 3,000 feet of boom on the water after the initial discharge in order to contain the oil. Today, BP updated the estimated amount of oil spilled to 15 to 39 barrels, which is equivalent to 630 to 1,638 gallons. That estimate is based on the amount of oil that has been recovered by the vacuum trucks, from the booms, or by hand on shore. An assessment of Thursday’s cleanup operations found small amounts of oil on the beach and along the east shoreline of the cove. A BP cleanup crew repositioned the boom to prevent the oil from spreading outside of the cove and will remove the remaining traces of oil. A shoreline cleanup and assessment technique team, comprised of members of the Coast Guard, EPA and BP, proceeded further northwest along the rocky wall of the cove this afternoon to determine the full extent of the oiling along the shore. These efforts are ongoing. A team is scheduled to conduct a comprehensive survey on Friday along the path of discharge in search of potentially submerged oil. 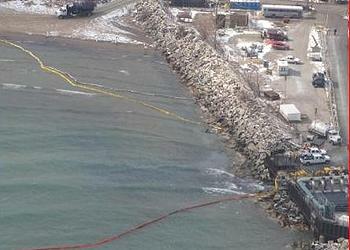 Air monitoring around the area has not indicated any air contamination related to the spill. ANCHORAGE, Alaska, March 28, 2014 (ENS) – It was 25 years ago that the tanker Exxon Valdez spilled more than 11 million gallons of crude oil onto the Alaska coast, when it struck Bligh Reef in Prince William Sound, but the damages and compensation from that spill are still being decided in court and in the Alaska legislature. The issue driving the ongoing debate is how much damage the spill is still causing Alaska’s fish, wildlife and environment, according to documents posted by Public Employees for Environmental Responsibility, PEER, a national nonprofit organization. The court case in what PEER calls “the longest running environmental lawsuit in history” involves part of the original billion dollar settlement with Exxon which called for an added payment of up to $100 million for environmental damages unknown at the time of the 1991 settlement. In 2006, the U.S. and Alaska governments jointly submitted a demand that the oil company pay $92 million to fund recovery for these injuries. This $92 million government “Reopener” claim has never been collected. Since then, the governments have asked for more time until environmental studies were completed. On March 14, the U.S. Justice Department and Alaska filed another status report claiming progress on ecological studies but indicating no resolution until the fall at the earliest. On March 20, Judge Holland issued an order stating that the court expects the scientific studies will be “completed by June of 2014.” The judge directed “that the parties will first endeavor to resolve disagreements, if any, amongst themselves” prior to returning to the court for “further proceedings” in October. “The Exxon Valdez Reopener provision was a legal commitment by all three parties to the historic 1991 spill settlement – the State of Alaska, the U.S. government, and Exxon – and all parties have betrayed this commitment,” said Rick Steiner, a PEER Board Member and retired University of Alaska professor. This week, Alaska’s Senate Judiciary Committee took up a measure – Senate Joint Resolution No. 25, introduced by Senator Berta Gardner of Anchorage – calling on the governments “to immediately file a motion in United States District Court to collect the full amount of the demand for payment of” $127,240,982 – the original claim plus 5% interest. The resolution also directs the Exxon Valdez Oil Spill Trustee Council to tap existing funds to “immediately initiate the subsurface lingering oil restoration work” until the Reopener claim is paid. Other wildlife populations, such as Pacific herring, and the AT1 killer whale pod, are still listed as “not recovering.” Thousands of gallons of toxic Exxon Valdez oil remain in beach sediments along Prince William Sound and in a frigid climate have degraded at a far slower rate than anticipated. RICHLAND, Washington, March 28, 2014 (ENS) – At least 18 workers at the Hanford Nuclear Reservation in south-central Washington State have reported symptoms related to chemical vapor exposure in Hanford’s tank farms over the past two weeks. Holloway said investigations in several tank farms have identified potential sources of vapor emissions. “In one farm, field investigations identified a cut in the insulation surrounding a pump pit as one potential source of vapor emissions. The cut was sealed with foam and the area was re-evaluated. Instruments no longer detect elevated levels of potential vapor-causing compounds in the local area,” the statement said. Evaluations in a third farm where vapors-related symptoms were experienced found no detectable measurement of vapors-causing compounds. Investigations are ongoing to identify other potential sources of vapors in the tank farms. Employees are encouraged to use additional protective gear, including respiratory devices, when the potential for chemical vapors exists. Hanford’s 56 million gallons of highly radioactive and chemical waste is stored in 177 underground tanks. WRPS is the Department of Energy Office of River Protection prime contractor responsible for safely managing the waste until it is prepared for disposal. The waste is stored in 149 older single-shell tanks and 28 newer and safer double-shell tanks that are grouped into 18 farms near the center of the 586-square-mile Hanford Site. The tank waste is material left over from years of World War II and post-war production of nuclear weapons. Holloway pointeed to a joint management/employee Industrial Hygiene Technical Panel that meets regularly to monitor efforts and help resolve chemical vapor issues and concerns. “Because of contractor turnover and shifts in management, there appears to be significant backsliding on protections for workers from chemical vapor exposure,” the Seattle-based group alleges. WASHINGTON, DC, March 28, 2014 (ENS) – A delegation of western elected officials today implored Secretary of the Interior Sally Jewell to equalize the priority given to recreation, conservation, wildlife habitat and “responsible” livestock grazing with that given to oil and gas exploration and extraction. The delegation pressing the case for balance with Interior Department officials includes Idaho State Representative Donna Pence, Montana State Representative Bridget Smith, and New Mexico State Representative Nate Cote, all Democrats. Also part of the delegation is Commissioner John Olivas of Mora County, New Mexico, which last spring became the first county in the United States to ban all corporate oil and gas drilling as a violation of the people’s civil and environmental rights. that the Interior Department consider a more fair and equitable royalty rate that ensures greater return to communities impacted by oil and gas exploration. DEARBORN, Michigan, March 28, 2014 (ENS) – Good news for Ford employees who drive electric and plug-in hybrid vehicles. This year, Ford plans to install EV charging stations at more than 60 of its offices, product development campuses and manufacturing facilities across the United States and Canada. Ford is building its charging network with General Electric, maker of GE WattStation™ charging stations, continuing the cooperation that began more than 100 years ago between Henry Ford and Thomas Edison, co-founder of GE. Installation will begin shortly with facilities in and around Ford headquarters in southeast Michigan and roll out across other facilities throughout 2014. “Ford’s commitment to sustainability extends beyond our fuel-efficient vehicles to include our daily workplace,” said Mike Tinskey, Ford director of vehicle electrification and infrastructure. “We know that a growing electrified vehicle infrastructure is key to making plug-in vehicles a viable option for more consumers. Ford is committed to doing its part to help develop that infrastructure,” Tinskey said. The Ford charging service will be free to employees for the first four hours of charging each day. By limiting the free charge offering to four hours, Ford is trying to encourage charging station sharing, enabling twice as many employees to charge at work for free. Ford estimates it will cost about 50 cents to fully charge each vehicle. With the new charging network, Ford employees commuting from up to 21 miles away in plug-in hybrid vehicles – Fusion Energi and C-MAX Energi – may be able to drive entirely on electric power to and from work. Fusion Energi and C-MAX Energi have an EPA-estimated mile per gallon ratings 44 city, 41 highway and 43 combined and have an EPA-estimated range of 21 miles electric. Drivers of the electric-only Focus Electric, which has an EPA-estimated range of 76 miles on a full charge, will have even more gas-free commuting potential. Ford points out that EV driving ranges vary with conditions such as hot and cold outside temperatures, driving behaviors, vehicle maintenance and lithium-ion battery age. Ford is also asking employees to use the MyFord® Mobile smartphone app to collect driving and charging information to help the company understand driving patterns and potentially influence future product design. MyFord Mobile is complimentary for five years from the vehicle sale date as recorded by the dealer. Subscriptions fees apply after five years. Based on data already gathered from Ford’s MyFord Mobile app, Ford Fusion Energi and C-MAX Energi drivers typically make three of their four daily trips in all-electric mode. By adding another charge opportunity during the day at the workplace, Ford says it might be possible for employees to be able to accomplish all of their workweek trips without using gasoline.